Aaron W. Jaco (@aaron_jaco) is the digital media specialist at Drake University in Des Moines, Iowa. This is the first post of a two-part series on Tumblr. The second post will be an interview with Grace Chapin, admissions counselor and curator of the University of Chicago’s college admissions Tumblr. Look out for it on Tuesday, Feb. 5. Drake University was not the first institution to join Tumblr—we were fashionably late but December 2012 was as good a time as any to join the party. The platform has emerged as an attractive component of the social toolkit for professionals in communications, admission and alumni and development. Tumblr’s user base is growing, by some measures surpassing that of its primary competitor, WordPress. And a recent survey suggested that teens use Tumblr more often than other social media tools, including Facebook and Twitter. A variety of higher ed institutions are using Tumblr as a vehicle to showcase their campus cultures, promote events, communicate with prospective students and share humorous photos. 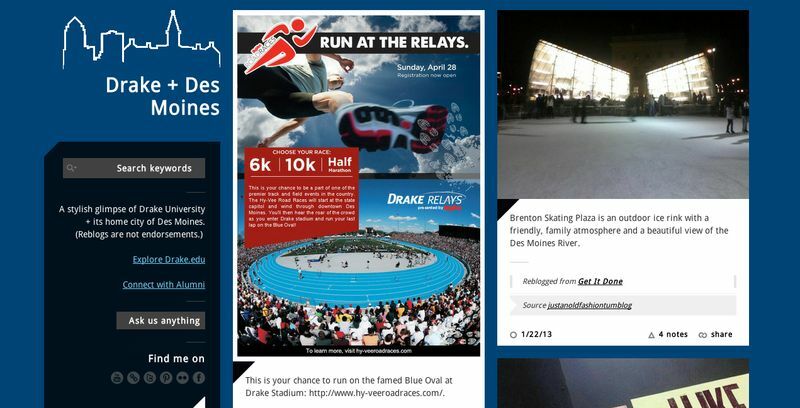 In December 2012, Drake University soft-launched a new Tumblr blog called “Drake + Des Moines.” Drake’s approach—which is intentionally stylish and focused on visuals—is to share stunning visual images of Drake and the city of Des Moines, Iowa. Like every major social media initiative, the Tumblr project began with clearly defined needs. Introduce prospective students to the university and the bustling capital city that Drake University calls home. Keep alumni emotionally connected with places and spaces where they spent so many of their formative years. Because no single initiative can meet these lofty goals, our Tumblr is part of a broader strategy. It is designed for visual panache. Images tell compelling stories about an institution—its geography, its architecture, its history, its culture. That’s why Drake previously launched a photo-of-the-day series across our social platforms, started a well-known Pinterest account and joined the Instagram world. Tumblr elegantly positions imagery above language. It’s easy to update and promotes social sharing. Posting to Tumblr is as easy as posting to Facebook once you become acquainted with the simple dashboard system. And like Pinterest, Tumblr is easy to source content from other users—“reblog” is to Tumblr what “repin” is to Pinterest—and we’ve been doing that liberally. It’s more self-contained and easier to customize than other social media platforms. You can use a wide array of malleable styles and templates (“themes”) to create a blog appearance that matches your website, print materials and the other visible extensions of your brand. After some research, my team paid $49 for a slick theme that had the features we were looking for—including attractiveness, social sharing, robust color and style customization, and a grid layout. A section of our target audience is already there. According to demographic data, about 20 percent of Tumblr visitors are under age 18, 40 percent are younger than 25 years old and roughly 70 percent are under 35 (Quantcast, January 2012). That’s a sizeable number of users who fall within the prospective student age range, and a high percentage of users who fall into the young alumni category. It’s easy to add widgets like Flickr feeds, Twitter feeds and question forms. Deciding when and how to promote the blog through existing venues, such as email, print materials and the university website. Ensuring we are taking the right approach—while remaining flexible enough to accommodate new, innovative ideas. Whether we end up tweaking the blog or not, the important thing is that we need to be constantly discussing and re-evaluating our objectives and approach and making intentional decisions—for both Tumblr and any other tool in our social media toolkit. Marquette University uses #ThankuMarquetteU to collect and display alumni-generated content. Northwestern University shares news and event photos from around the web. Yale University shares a variety of photos, images and videos to communicate admissions information, student highlights, musical performances and other areas of interest to prospective students. Oberlin College keeps things light with excerpts from their student newspaper, snapshots from concerts and reblogged photos of albino squirrels. As always, I hope you’ll leave a comment with your questions, experiences and examples. Hey Eric, that’s awesome! I wish you the best of luck as you explore…and I’d love to know how your thought process develops re: the value of the platform in your work/to your institution. As I said in the blog, we’re new to Tumblr over here at Drake, so I definitely am not the sage on a stage…conversation is valuable and necessary. Aaron, I’ve read a bunch of “Why Tumblr” blog posts, trying to understand it and its Higher Ed potential, but your post was the first one that actually made me start my own account just so I can follow Drake + Des Moines and start trying to figure it out. Thank you.